A diverse content marketing strategy is a must for any modern day marketer. While microcontent has been rapidly growing in popularity (and rightfully so), long-form content such as eBooks provide a deeper and more detailed edge to your marketing content. Creating an eBook is a great way to publish research, start a discussion with your audience, and interact with your peers. However, a truly great eBook is more than just an extended white paper. Keep these steps in mind to make sure your next eBook is as powerful as possible. While this might seem obvious, picking a relevant topic (and then staying on-topic throughout the length of your eBook) will determine the success of the entire publication. Your topic should be both captivating for a general audience and directly linked to your business goals. If you have one of these without the other, you’ve destined your eBook for failure before you’ve even hit publish. 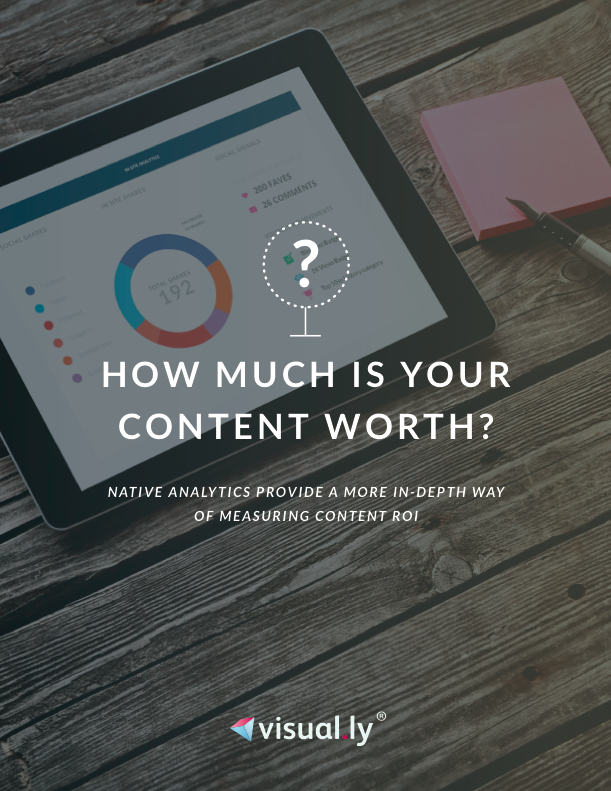 For example, Visually’s latest eBook, How Much is Your Content Worth, both explores an interesting topic (How native analytics can provide a better look at your marketing ROI) and nicely connects with Visually’s new native analytics solution. Once you’ve settled on a compelling topic, the next step is to choose your tone. Do you want the eBook to be a heavy manifesto aimed at changing worldviews? B2B marketers Velocity Partners did just that in their 2010 ebook, aptly titled The B2B Marketing Manifesto. On the other side of the spectrum, you can keep the tone light and clever, such as in Marketo’s Big Marketing Activity Coloring Book, which cleverly presents marketing advice in the form of a children’s activity book. The reality is that your next eBook will fall somewhere in between these two extremes. But no matter which route you take, it is important to decide on a tone and stick with it. There are multiple formatting questions that will dictate the look and feel of your eBook. The first and easiest to answer is the layout – should it be landscape or portrait? 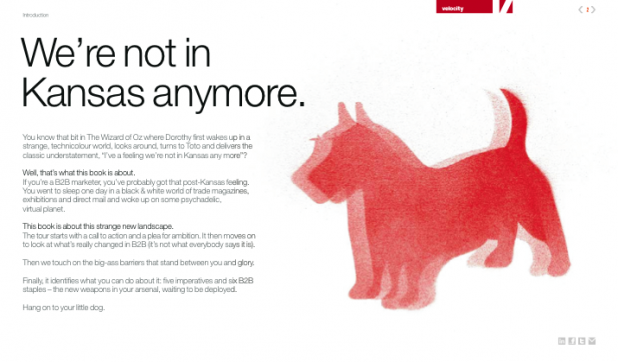 Next, think about how your audience will read it – should it be a downloadable .PDF? Or will you host it online, either on your own website or using a content manager like Uberflip or SlideShare? Or, will your audience be likely to read it on a phone or tablet? In addition to creating online versions optimized for handheld devices, it may be worth publishing your eBook through Apple’s iBooks Author. The final question to answer is if your eBook will be digital only, or if you should create physical copies. Physical objects fill a niche within the content marketing landscape, and sending customers or prospective clients your eBook can be a gentle reminder that you’re thinking of them. 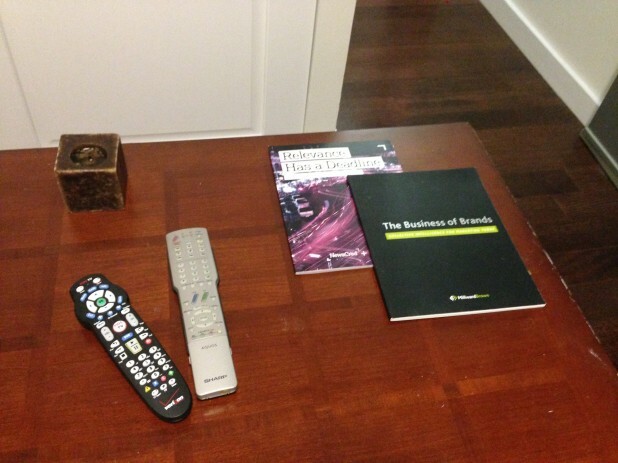 Examples such as NewsCred’s Relevance Has a Deadline and Millward Brown’s The Business of Brands make for nice coffee table books, too. No matter how great your eBook is, getting it in your audience’s hands is at least half the battle. And as with any other marketing campaign, you’ll need a multi-faceted plan to reach the widest and most relevant audience possible. Good first steps include featuring your eBook in your newsletter, promoting it on social media, and linking to it on your website. However, these are all one-time use cases. Advanced tactics include creating a series of topical blog posts to serve as companion pieces leading up to the eBook’s launch, partnering with influencers within the industry, and sharing bite-sized insights on social media. Teasing your eBook with microcontent is a a great way to easily generate buzz. Perhaps the most important marketing tactic is investing in a well-designed landing page or microsite. 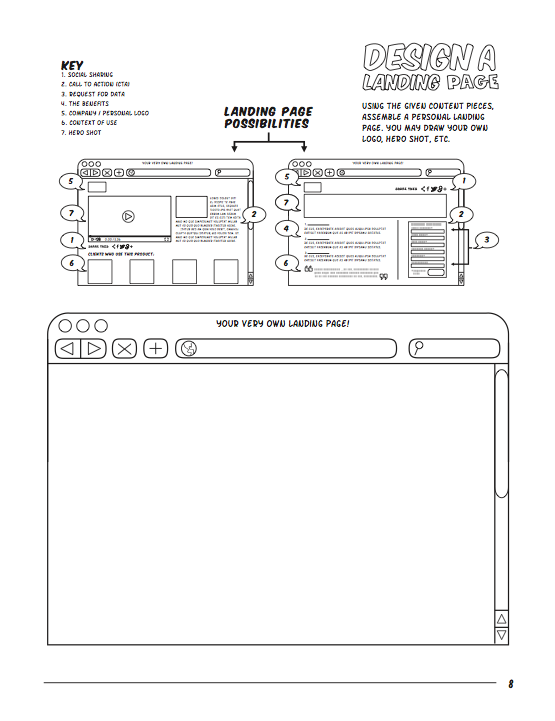 Much has been written about landing page design, and the best examples follow visual design best practices. Keep it clean, keep it simple, and ask for only the information you truly need to know. 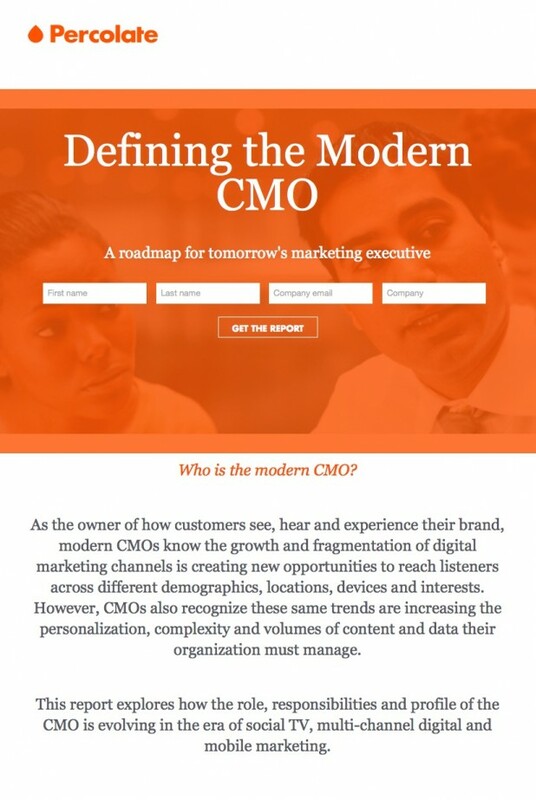 Percolate does a great job of this with the page for a recent eBook, Defining the Modern CMO. Even in an era of social media and hyper-connectedness, it can be easy to forget that digital media consumers are all sharers at heart. Your audience will want to not only consume content for their own personal gain, but also share it with their own peers, clients, and connections. For the digital version of your eBook, make sure to include social media sharing links, links to your web presence, and a call to action. 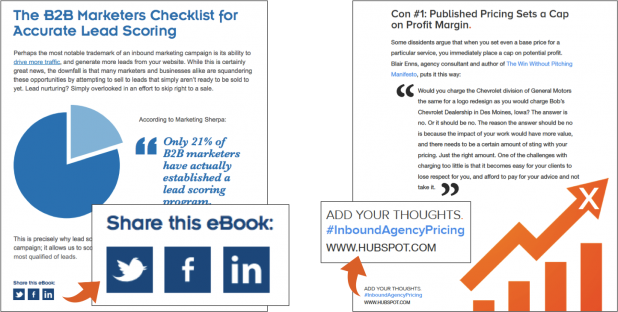 Examples from two of Hubspot’s publications do a great job of this. Including the ability to share with just one click takes the guesswork out of crafting social media content and increases the likelihood that your content reaches a wider audience. And adding something as simple as “add your thoughts” with a hashtag and URL is a low-pressure way of inviting readers to continue the conversation. While these calls to action are simple and take up just a corner of a page, they can be instrumental in keeping the conversation going. Now that you know the right questions to ask to make the best eBook possible, there’s just one thing left to do – create all the content, put it all together, and hit publish. Good luck! Jon Salm is an associate client analyst at Millward Brown Digital in New York City and a freelance data journalist in the Visually marketplace. He has a bachelor’s degree in English from Washington and Lee University. You can follow him on twitter @Jon_Salm.